It would have been easy for Lee Smith to turn his back on rugby union after a stint with Wasps in 2009 ended after only five months. Having arrived at Adams Park with Super League honours and international recognition behind him, injury and personal issues brought a premature end to Smith's big move to the Premiership. However, after returning to Leeds and then Wakefield in Super League, he accepted a second crack at union with Newcastle Falcons earlier this season. Why would a player with a vast collection of honours in league go through the rigours of switching codes for a second time when so many others have struggled to adapt? Smith is clear. Sam Burgess's move to Bath from Australian NRL side South Sydney in 2015 is much anticipated, with his ball-carrying, defensive work and offloading skills all appealing to the 15-man game. There remains some doubt about where Burgess will be employed, as he can play anywhere across the back-row in league, but like Andy Farrell - another code-switcher - he could find himself in the centres. However, Smith is concerned that trying to mould Burgess could take away some of his natural talent. "I went on a show with Brian Moore when I made my debut against Leicester and I said anyone can be a success (in union) if they get the right coaching, and play to their strengths," Smith said. "Don't try to change a player into something they're not. They need to use a player's strengths and work with it." "If I got into my 40s and 50s looking back on my career without having a proper go at it I'd have been disappointed with myself," he told BBC Sport. "Obviously I had a go with Wasps and it didn't work out, but I'm very fortunate that Newcastle came in and wanted to sign me." Rugby league has been a useful talent pool for union clubs since the advent of professionalism in the late 1990s reversed a trend of players moving the other way for financial and sporting rewards. 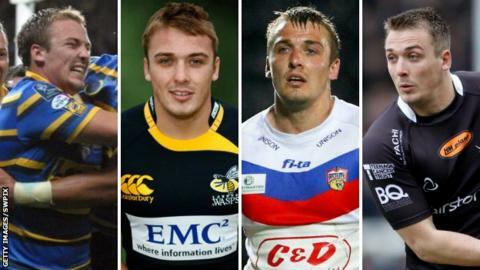 Whereas once it was union stars such as Jonathan Davies, Scott Quinnell, Kel Coslett, Billy Boston and Tom van Vollenhoven who moved into the 13-man game, now it is Sam Burgess, Kyle Eastmond and Joel Tomkins who have brought their skills into union. Not everyone can make the same impact in both codes, as countless stars including Henry Paul, Lesley Vainikolo and Shontayne Hape can testify. "I had a great time in rugby league, but there's only a certain type of player that can move codes," said Smith. "They're two totally different games. All the rucking and mauling compared to the play-the-ball is completely different. "Moves are similar, but it's different game plans. The fitness has to be different. You need to be intense for one or two minutes in union and then you get a break, while league is a bit more continuous. That's something else I'm going to have to work on during the off season." While Smith's rugby league career brought him Super League Grand Final winners' medals, and a Harry Sunderland Trophy for man of the match in the 2008 final, the move to Newcastle has seen him experience the opposite end of the scale. Falcons feared potential relegation from the top flight until the penultimate game of the current campaign and have a big summer ahead to ensure improvement is made next season. "I think the culture has to be player-driven, the coaches can only give you so much," Smith said. "I've been about a long time and seen a lot of things," Smith said. "But I still class myself as young, and the more you hang about with the younger lads it keeps you young. "Keith Senior used to be like that, he'd hang around with all the young lads and still thought he was 19 like us lot. "It keeps you young but I've got experience. I've got little things I learned in rugby league that I can bring through to Newcastle and I'm trying to do that in little ways. "During the off-season I will probably have more to time to spend with the coaches and bring my knowledge of that game to mix in with the rugby union stuff." "Going back, Leeds had lots of very good professionals. I got brought up by people like Kevin Sinfield, Jamie Peacock, Danny McGuire and Rob Burrow - they were very good pros and it filtered down into the academy. "That's how you were brought up, if you stepped out of line then you got knocked back into line. That's somewhere where maybe at the Falcons we can tighten up a bit in the off-season. "We need to set our standards ourselves, so when we get beat we can ask ourselves questions why and take a bit of responsibility off the coaches." With nearly 200 games for club and country across the two codes on his curriculum vitae, Smith has grown from young gun to seasoned pro. The aim now for the Morley-born three-quarter is to establish a regular place at Kingston Park, once the Falcons have completed their 2013-14 campaign with the visit of Exeter. "It's a bit frustrating going in and out, but you've got to look at the bigger picture," Smith continued. "I'm getting my first summer holiday for something like 13, 14 years which will be brilliant. I'll go away and spend some time with the family and then we're back in mid-June. "I've got two and a half months then before the Premiership season starts, where that is my real learning curve. "That's when, in September, I want to be hitting the ground running, starting in the team and nailing down a position where I'm going to play and playing week in, week out."